This major project involved the construction of a new deep water port to replace the existing Mina Sulman Port and the reclamation of an area for industrial development at South Hidd to the north east of the Kingdom of Bahrain. 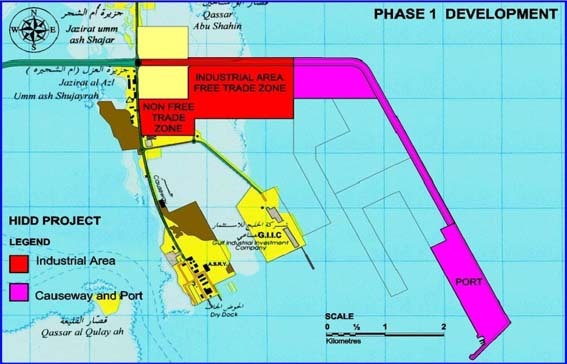 The need for the project came as a result of many factors that prevented the expansion of the existing Mina Sulman mainly, the draft limitation of 10.5m on the approaches where the presence of aquifers prohibit further deepening; refurbishment needs and the outreach and age of quay cranes together with the need to create new industrial areas to cater for the increased demand. The scope of the project comprised the planning, design, construction supervision and contract management of Phase 1 of the development. Reclaimed land of 240 Ha using around 15 million cubic metres of material forming the Industrial Area. 230 Ha of reclaimed land to the east of the Industrial Area using around 21 million cubic metres of dredged material forming the Free Trade Zone (90 Ha), the port area of 110 Ha and to provide a corridor for the Port access roadway. 1.8 km of concrete block quay wall with 15m depth of water for the container terminal and general cargo handling. 2 No. Ro-Ro ferry berths and 2 No. piled jetties forming the Small Craft Berths. Over 7 km long rock-armoured bund along the northerly and easterly boundaries of the development and a breakwater at the south end of the Port with concrete wave-wall. Port buildings including Harbour Master’s Office & Control Tower, Container Terminal Building, Container Freight Station, Transit Sheds, Aluminium Export Shed, Workshop, Port Operation Building, Passenger Terminal, Port Gate, Customs Clearance in addition to other buildings. The total area of port buildings is approximately 80,615m2. Crane beam constructed on bored cast-in-place concrete piles having a total length of 1.5 Km and crane rails. Container terminal having an approximate area of 72.5 Ha constructed with heavy duty pavements using block paving on a lean mix concrete base. Industrial Area buildings including Gatehouses, Medical Centre, Business Centre, police Station, Administrative Offices and Fire Station. Main Administration Building with a total built-up area of approximately 6,600m2 and Main Customs Building with an approximate area of 7,400m2 for the operation of the Industrial Area. A Sewage Treatment Plant which comprises primary, secondary and tertiary treatment facilities. All infrastructures for Phase 1 including roads and access roads, water distribution systems, irrigation networks, wastewater and storm drainage networks, electrical, telephone and telecommunications networks and cabling.